I'll be talking primarily about my experience before, during & after the procedure. For more technical details regarding the comparisons of LASIK, Epi-LASIK & ReLEx SMILE, you can refer to my Part 1 blogpost! I had my Epi-LASIK done at Clearvision Eye Clinic & LASIK Centre! 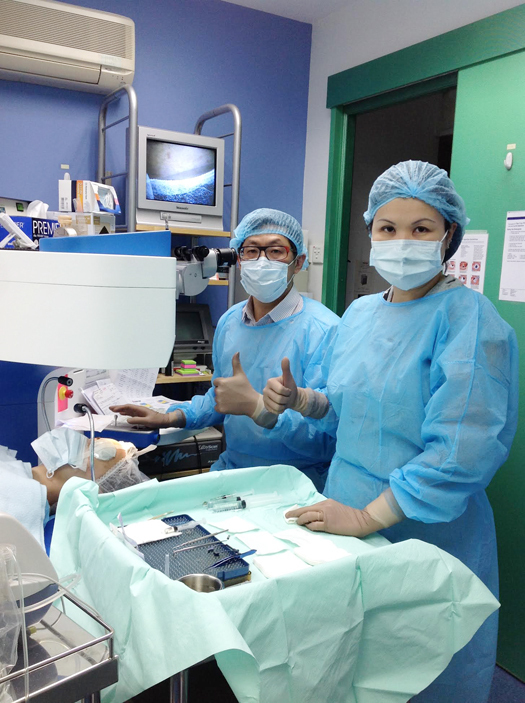 Quote "Sophie Willocq" at the counter to get S$121 off your Epi-LASIK package! For starters, here's some pictures of me with lensless spectacle frames (I know, the irony) since I now no longer need prescription glasses or contact lens! Let's face it, real prescription spectacles generally aren't always that flattering. Especially for girls! I find some guys look pretty good/even better with glasses, but most girls want to be vain & wear contact lens (myself included), which can be tiring + costly. I DON'T NEED GLASSES ANYMORE! On to my actual experience! Assuming you've already gone for the consultation with Clearvision Eye Clinic & LASIK Centre & everything checked out fine, you can arrange your actual procedure anytime after! Your consultation results are valid for 6 months; thereafter it is highly recommended that you get a new test done to ensure you're still suitable for the procedure. Once you decide on a suitable day (you will need about 5-7 days rest thereafter), you can easily arrange for it provided you give about 2 weeks' notice as they can be quite busy. Luckily the procedure is so short & simple that they can slot in many patients per day! You'll have to let your eyes rest for about a day or so (of course the longer the better). This might be tough if you have work & so on, but it's for the better! I actually had my Epi-LASIK done a mere few hours after touching down from a long flight, so I was quite tired but I figured I'd be sleeping a lot the next few days anyway. I don't suggest you follow what I did though lol. Recommended would be ample rest to avoid tired eyes! After arriving at the clinic, I went through a few more simple eye tests to make sure everything was ok. While sitting there I saw another young guy (accompanied by his friend, aww #bromance) going for his own surgery. Pop in & then pop out. All in a matter of minutes. Seemed simple enough! The doctor (Dr Tony Ho) wasn't available yet, so the clinic suggested we grab lunch first. Luckily the clinic is in town, located just behind Lucky Plaza! Finally it was my turn & I slipped on a typical hospital gown (but still wearing my own clothes underneath - I opted for a comfortable sundress that day) as well as shower cap. I had previously heard scary stories about how you can smell the laser burning your cornea & see it coming towards you etc etc... these were of course all with reference to LASIK, which involves actual cutting of your cornea; Epi-LASIK involves no cutting at all. In reality, it wasn't scary at all. All you see is blackness with a red dot in the centre & that's what you need to be focusing on for the laser to do its job (which is just reshaping the top layer of cornea). It's done eye by eye. My left eye went first & it behaved very well - focused easily & the whole thing took barely a minute. Stared at the red dot, felt nothing at all & it was over. My right eye was a little more troublesome. I had problems staying focused on the red dot; not sure why, but it meant that it took slightly longer as I had to keep re-focusing & trying to stay on the red dot rather than let my stupid eye wander (got what to see, it's all black elsewhere). Still, all in all it was still a matter of minutes rather than one minute! Immediately you open your eyes & you can see pretty clearly! Thereafter I was ushered into a dark room where the clinic helped to put my first eyedrops. In the beginning I had about 4-5 eyedrops to apply per day, which should be about 10-15 minutes apart. This meant that I was there in the room for about another hour as they have to wait in between eyedrops. But time flies, as by this point the discomfort starts to set in & that's all I'm focusing on. Some of my eyedrops & eyelid wipes! It's very important to keep your eye area clean to avoid infection. #1 This should be evident, but no makeup. You will be tearing anyway. #2 Bring a sweater! Waiting around can get chilly & you'll want to be feeling snuggly. #3 You absolutely need somebody with you as you can't get home alone! The eyedrops are meant to be taken about every 3-4 hours, but if you're sleeping during this time you should miss the slot! No need to set alarms or what not, as rest is the most important for your eyes. I won't lie, Day 2 was the worst. On Day 1 (actual day) there was some discomfort but it was alright. On Day 2, the discomfort was the worst. I can't call it painful per se, because it's not, but it was just really uncomfortable regardless of whether your eyes are open or closed. I was like a vampire; I stayed in a dark bedroom all day & slept about 18 hours or so... primarily because my eyes felt tired all the time, but also because there's nothing else I could do. Day 3 was still uncomfortable, but slightly better & I also had my first follow-up visit with the doctor that day so I had no choice but to drag myself out of my dark sanctuary! T_T I actually went out wearing a giant black floppy hat & the post-surgery sunglasses. I must have looked majorly in mourning but I really had to avoid sunlight at all costs because it bothered me a lot! Also, the good news was that the doctor told me my eyes were healing very fast - much faster than most people! At Day 3 my eyes were about 60% healed, whereas most people are maybe only at 40%. So I took my higher level of discomfort as a good sign of healing! It's like... you know how wounds can be super itchy? It means it's healing! So I guess it can be the same for eyes too? LOL not fashionable at all but they block out A LOT of light. I even slept with them on! They were basically my best friend those few days. By Day 4 onwards I was much, much better. Just overnight & the difference is huge! I was ok to go out again (just remember to avoid dusty places) & could FINALLY USE MY PHONE. LOLOL. The one & only proven way thus far for me to not use my phone. I literally didn't touch it for a few days as I was unable to see properly! Most people are ok to go back to work after 5 days (you will be given MC) but it's up to you. I personally didn't wear any makeup for 6 days. Find out more about Epi-LASIK at their website! But honestly, under no circumstances should you still go for LASIK. To put it bluntly, it's a rather outdated correction method & Epi-LASIK has many more benefits + fewer risks! The whole recovery period takes up to 6 months for your vision to fully stabilise, but your vision will be pretty clear within the first few days. It won't be perfect then yet, but you won't need any spectacles or lenses & will be able to see sufficiently well with no issues! In the meantime... more selfies with fake spectacles! 2 comments on "Epi-LASIK (Part 2)"
Hi Sophie. :) You know for LASIK, there is this metal contraption that is used to keep the eyes open? Did you have to go through that as well? Or did you just have to open your eyes on your own like normal? :) The thing I'm afraid of is having that thingy put into my eyes to keep them open because it seems so painful!